End Frame Video Art Project 3: Present, a Philippine video art festival, commences this month as the third edition and new format of the video art festival which took place in 2006 and 2007. Presented by Visual Pond, the theme Present refers to the current project’s focus on selected Philippine contemporary artists’ practices in video art. Throughout the festival, each artist stages a show presenting new video work in various venues from January 2011 to January 2012. 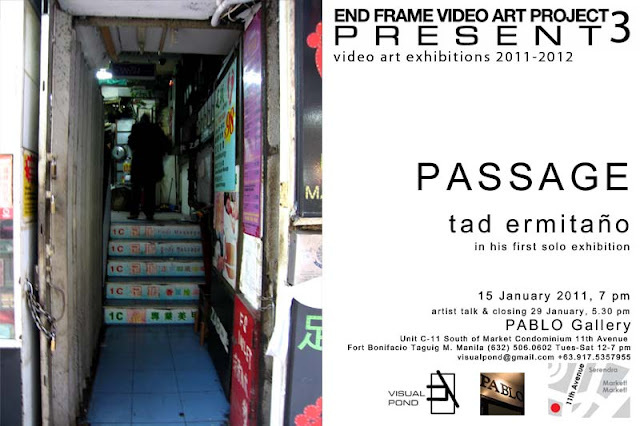 The festival proudly launches with Passage, a solo exhibition by Tad Ermitaño, opening on January 15 at Pablo Gallery, Fort Bonifacio. A site-specific work responsive to the two rooms of Pablo and the stairs between them, Passage utilizes multiple projections and video mapping technology in a crossover of fairy tales and science fiction. Ermitaño, who has studied philosophy, biology and filmmaking, has participated in several local and international group exhibitions and film festivals, including the 2002 videoart.mov, the 2004 Hong Kong International Film Festival, the 2006 Ogaki Biennale, the 2007 Dime a Dozen at Lopez Museum, the 2008 Inter-society of Electronic Arts juried exhibition and recently, the Hear to Ear exhibition of Fete dela Wsk. Passage marks the first solo exhibition of this media artist, running until 29 January 2011 with a closing talk by the artist at 5:30 pm. Pablo Gallery, located at C-11 South of Market Condominium, 11th corner 26th Avenue, Fort Bonifacio, Taguig, is open Tuesday to Saturday from 12 noon to 7:00 pm, tel. no. (632) 506-0602. Other confirmed artists presenting new works for End Frame 3 include Manny Montelibano, Claro Ramirez, Kiri Dalena and Kaloy Olavides with the full schedule and line-up to be announced soon. For inquiries on the project, call +63917-5357955 or email visualpond@gmail.com. Passage is with thanks to Green Papaya Art Projects.